OVER 50% OF THE DRIVERS FARES ARE PAID IN CASH!!! CREDIT CARD PAYMENTS DEPOSITED INTO YOUR ACCOUNT DAILY. MAKE OVER TWICE PER MILE THAN UBER & LYFT. LATE MODEL, WELL MAINTAINED VEHICLES WITH CUTTING EDGE TECHNOLOGY INCLUDING STATE OF THE ART GPS DISPATCH AND IN-VEHICLE CAMERAS FOR YOUR SAFETEY. AVOID WEAR AND TEAR ON YOUR PERSONAL CAR. A LOCAL COMPANY WITH OVER 55 YEARS UNDER THE SAME OWNERSHIP. 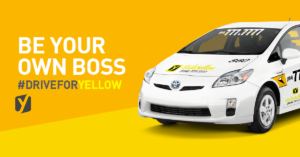 Job Type Driver, Be your own boss! Best Number to Contact* A valid phone number is required.